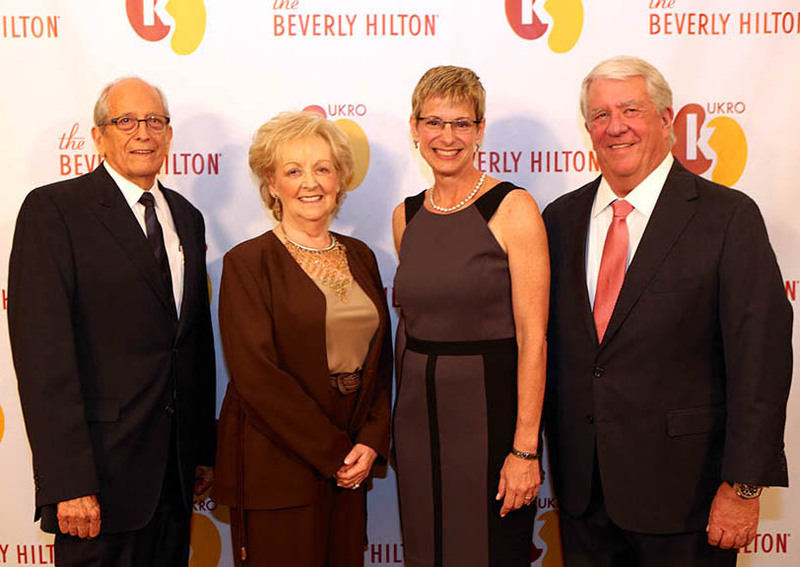 The 2014 UKRO Benefit Dinner held on Friday, September 12th at the Beverly Hilton Hotel was truly special, raising significant funds to support the USC/UKRO Kidney Research Center and honoring three outstanding individuals! To view more photos, please visit our 2014 benefit dinner album on Facebook. 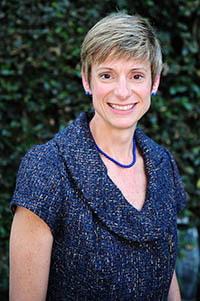 Elizabeth Garrett was appointed Provost and Senior Vice President for Academic Affairs on October 28, 2010. As the university’s second-ranking officer, she oversees the USC Dana and David Dornsife College of Letters, Arts and Sciences as well as the Keck School of Medicine of USC and 17 other professional schools, in addition to the divisions of student affairs, libraries, information technology services, research, student religious life and enrollment services. She also sits on the governing board of the Keck Hospitals of USC. As Provost, Garrett has directed substantial new efforts to hire transformative faculty members, including initiatives to recruit faculty in neuroscience, the humanities, and the social sciences, with the goal of catalyzing targeted fields of scholarship and invigorating USC’s research environment. She has also accelerated the recruitment of Provost Professors and created the Provost’s Postdoctoral Scholars Program in the Humanities. Under Garrett’s guidance, the USC Strategic Vision: Matching Deeds to Ambitions was developed over two years and adopted by the USC Board of Trustees in December 2011. She has been instrumental in the integration of the new Keck Hospitals of USC and the faculty practice plans into the university, which created an academic medical center on the Health Sciences Campus. Garrett is the Frances R. and John J. Duggan Professor in the USC Gould School of Law. In addition to this primary faculty appointment, she has joint appointments in USC Dornsife College and the Price School of Public Policy, as well as a courtesy appointment in the USC Annenberg School for Communication and Journalism. She serves on the Board of Directors of the Initiative and Referendum Institute at USC and from 2009-2013 served as one of five commissioners on the California Fair Political Practices Commission, the state’s independent political oversight agency. Then-president George W. Bush appointed her to serve on the nine-member bipartisan Tax Reform Panel in 2005. She previously served as director of the USC-Caltech Center for the Study of Law and Politics. Garrett previously served as USC’s Vice President for Academic Planning and Budget, a position she had held since June 2006. Garrett’s primary scholarly interests are legislative process, direct democracy, the federal budget process, democratic institutions, statutory interpretation, administrative law and tax policy. The author of more than 50 articles, book chapters and essays, she is co-author of the fourth edition of the leading casebook on legislation and statutory interpretation, Cases and Materials on Legislation: Statutes and the Creation of Public Policy, and co-editor of Statutory Interpretation Stories and Fiscal Challenges: An Interdisciplinary Approach to Budget Policy. Before joining the faculty of USC, she was a professor of law at the University of Chicago, where she also served as deputy dean for academic affairs, and she has been a visiting professor at Harvard Law School, the University of Virginia Law School, Central European University in Budapest, and the Interdisciplinary Center Law School in Israel. Before entering academics, she clerked for Justice Thurgood Marshall on the U.S. Supreme Court, and she served as legal counsel and legislative director for Senator David L. Boren (D-Okla.). She received her B.A. in History with special distinction from the University of Oklahoma and her J.D. from the University of Virginia School of Law. Garrett is a fellow of the American Law Institute, a life fellow of the American Bar Foundation, and a member of the Pacific Council for International Policy. She was inducted as a Harold Lasswell Fellow of the American Academy of Political and Social Science in 2013. Barry Hoeven is the Chairman of Westport Properties, Inc., and US Storage Centers, Inc., which were founded in 1985 and 1998 respectively. Westport Properties is a real estate development and management company that owns through affiliated entities or manages self-storage properties. Currently, there are approximately 75 self-storage properties in twelve states, representing 5.2 million square feet. Barry has over 30 years of real estate experience with a heavy emphasis in all aspects of self-storage and business park development. His prior work experience included various senior level positions with Public Storage, The Irvine Company and the Colliers-Seeley Company. Barry received a Business Degree from USC in 1972, with an emphasis in Finance and Marketing. He also earned his MBA in the Entrepreneurial program at USC in 1973. He is on the Board of Advisors for both the Lloyd Greif Center for Entrepreneurial Studies at USC and the Board of Advisors for the Center for Real Estate in the Paul Merage School of Business at UCI. Barry has been on the Orange County Board of the USC Marshall Associates for the School of Business. 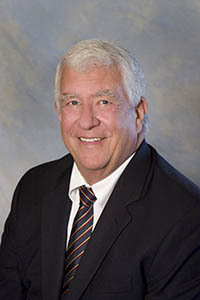 He has also been a Board member and is active with the California Self Storage Association, and is working with the Family Business Council at California State Fullerton. Barry founded Kure It which raises money to directly support kidney and other underfunded orphan cancer research programs. Since 2007, Kure It has raised over $2.5 million. In addition, he is involved with other organizations in Southern California which support children and career development. He has three adult children and resides in Newport Beach, California. The Mr. and Mrs. Samuel Oschin Family Foundation is dedicated to supporting health care, education, the arts, science, and innovations in technology. Founded in 1981, the foundation continues the commitment to charitable giving of Samuel Oschin, an entrepreneur, business leader, and philanthropist. For more than 30 years, the realization of this philanthropic vision has had a profound impact on our region. One of the foundation’s most transformative commitments was to the California Science Center Foundation, enabling the acquisition, preparation, and exhibition of the Space Shuttle Endeavour, temporarily on exhibit in the Samuel Oschin Pavilion at the California Science Center while the Samuel Oschin Air and Space Center is under construction. That Center will permanently house the Endeavour in launch position and will include innovative, hands-on exhibits to inspire adventure and discovery and to encourage learning about science, space exploration, astronomy, aeronautics, and the technologies that help us understand our universe. In addition, the Oschin Family Foundation has significantly enhanced the cultural landscape of Los Angeles, the state of California, and the world astronomy stage. Griffith Observatory’s renovated and newly named Samuel Oschin Planetarium features a 300-seat theatre, the most advanced star projector in the world, a cutting-edge all-dome laser projection system, and one of the largest planetarium domes on the planet. This unique facility will support world-class scientific educational programming for audiences of all ages for generations to come. Another major contribution of the Oschin Family Foundation to the field of science and space exploration was the dedication of a 48-inch Schmidt telescope to Palomar Observatory and Caltech. The Samuel Oschin Telescope has thus far enabled the discovery of a number of dwarf planets, including Sedna and Eris, which triggered discussions in the international astronomy community that led to Pluto being re-classified as a dwarf planet. In the medical field, the Samuel Oschin Comprehensive Cancer Institute and Outpatient Cancer Center at Cedars-Sinai Medical Center, established with an extraordinary gift from the Oschin Family Foundation, serves 5,000 patients each year and is an invaluable component of Cedars’ concentration on cancer, focusing on prevention and on community well-being throughout the Los Angeles area. The Oschin Family Foundation additionally supports a vast array of organizations and initiatives devoted to education, health, disadvantaged youth, the elderly, and animal programs, including UCLA’s People Animal Connection (PAC), a pet-related program at Volunteers of America, Temple B’nai Hayim, the Jewish Home, the ADL, the Jewish Federation, the Downtown Women’s Center, Hollygrove, the Blind Children’s Center, Meals on Wheels, Union Station, the University of Judaism, the Junior Blind of America, and Mattel Children’s Hospital UCLA Chase Child Life Program. Foundation gifts and grants have also provided scholarships for disabled and disadvantaged minority students at UCLA and Stanford University, built a children’s playroom at Cedars-Sinai, and supported a variety of state institutions, including the Natural History Museum’s Hall of African Mammals in Los Angeles. The exceptional generosity displayed by the Mr. and Mrs. Samuel Oschin Family Foundation reflects the true spirit of life and makes this award so richly deserved. 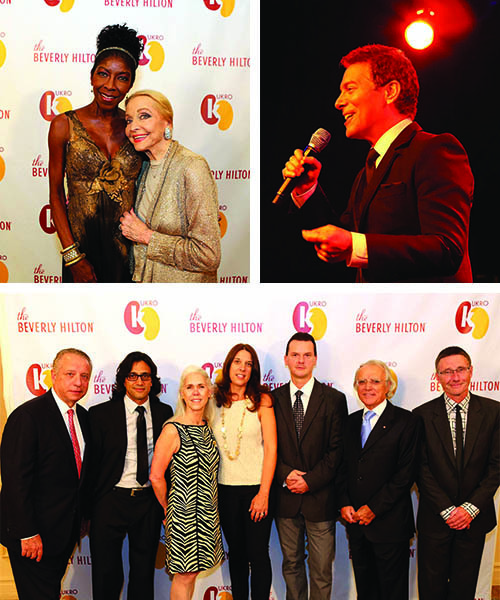 Michael Feinstein, the multi-platinum–selling, two-time Emmy and five-time Grammy Award–nominated entertainer dubbed “The Ambassador of the Great American Songbook,” is considered one of the premier interpreters of American musical standards. His 200-plus shows every year have included performances at Carnegie Hall, the Sydney Opera House, and the Hollywood Bowl, as well as the White House and Buckingham Palace. As a five-year-old in Columbus, Ohio, Feinstein got his start playing piano by ear. After graduating high school, he worked in local piano bars for two years, moving to Los Angeles when he was 20. The widow of legendary concert pianist/actor Oscar Levant introduced him to Ira Gershwin in 1977, and Feinstein became Gershwin’s assistant for six years, gaining access to numerous unpublished Gershwin songs, many of which he has since performed and recorded. Gershwin’s influence provided a solid base from which Feinstein has evolved into a captivating performer, composer, and arranger of his own original music. He also has become an unparalleled interpreter of music legends such as Irving Berlin, Jerome Kern, Johnny Mercer, Duke Ellington, and Harry Warren. Feinstein’s most recent CD, released in 2013, is Change Of Heart: The Songs of Andre Previn (Concord) recorded in collaboration with legendary composer/conductor/pianist Andre Previn to celebrate that artist’s catalog of songs featured in motion pictures. Feinstein’s previous CDs include The Power Of Two, collaborating with Glee and 30 Rock star Cheyenne Jackson; Cheek To Cheek, recorded with Broadway legend Barbara Cook; and We Dreamed These Days, whose title song Feinstein co-wrote with the late Dr. Maya Angelou. His 2012 book, The Gershwins and Me (Simon & Schuster), is a Los Angeles Times best-seller that is combined with a CD of Gershwin standards performed with Cyrus Chestnut at the piano. Feinstein’s Emmy-nominated TV special, Michael Feinstein—The Sinatra Legacy, is currently airing across the country, and his PBS series Michael Feinstein’s American Songbook returned in 2013 for a third season and is now available on DVD. For his nationally syndicated public radio program, “Song Travels,” Feinstein interviews and performs alongside of music luminaries such as Bette Midler, Neil Sedaka, Liza Minnelli, Rickie Lee Jones, David Hyde Pierce, and more. In 2007, Feinstein founded the Michael Feinstein Great American Songbook Initiative, dedicated to celebrating the art form and preserving it through educational programs, master classes, and an annual high school vocal academy and competition that awards scholarships and prizes to students across the country. Feinstein serves on the Library of Congress’ National Recording Preservation Board, an organization dedicated to ensuring the survival, conservation, and increased public availability of America’s sound recording heritage. Named principal pops conductor for the Pasadena POPS in 2012, Feinstein made his conducting debut in 2013 to celebrated critical acclaim. Under his leadership, the Pasadena POPS has quickly become the nation’s premier presenter of the Great American Songbook in the orchestral arena, delivering definitive performances of rare orchestrations and classic arrangements. Feinstein’s nightclub, Feinstein’s at Loews Regency—since closed for an extensive hotel renovation—presented the top talents of pop and jazz from recent years. Feinstein opened a new club last year, Feinstein’s at the Nikko (in San Francisco’s Nikko Hotel), plans to reopen in New York in 2015, and also plans a future nightclub in London. Through his live performances, recordings, film and television appearances, and his songwriting—in collaboration with Alan and Marilyn Bergman, Lindy Robbins, Bob Merrill, and Amanda Green—Feinstein is an all-star force in American music. For more information, please visit www.MichaelFeinstein.com. Jody & Peter Biehl, Ph.D.
Kiran & Sohan Dua, M.D. Karen Reckamp, M.D. & Robert Figlin, M.D., F.A.C.P. Stephen B. Gruber, M.D., Ph.D., M.P.H. Jill & Andrew McMahon, Ph.D.
Janet Pine, M.D. & Carmen Puliafito, M.D., M.B.A.